Long fascinated & puzzled by the name, I decided to delve deeper into the history of Frenchman's Creek on the Helford River in SW Cornwall. When and who put the Frenchman up the creek? Was it the author of a romantic novel published in 1941, or did this secretive inlet hold a much bigger, darker secret? My search started at Helston Museum and my heartfelt thanks go their team and the interest they took in my quest for the truth. Immortalised by Daphne Du Maurier's novel of that name, Frenchman's Creek really does exist and yes, it is just as dreamy and tranquil a location as described in print. Walking along the ancient footpath that flanks its shoreline, or standing as the early morning mist hangs over its brackish waters, you can visualise the romance of the beautiful lady St. Columb and her french pirate all too easily. Frenchman's Creek is one of seven inlets on the navigable Helford River. It is undoubtedly one of the most enhancing locations in Cornwall and hardly surprising that Du Maurier chose it for her honeymoon location. Shrouded in secrecy, with tree lined banks and eerie silence broken only by bird call, the creek must have left a lasting impression on the budding writer. The best way to see this secret inlet is on a sunny morning at high tide, by water, or if you're feeling less adventurous, you can follow the footpath from Helford Village - the place that time forgot. If possible, take a flask and picnic, essential props that will enable you to stop and absorb this fascinating corner of Cornwall, one that is steeped in maritime history. The earliest cartographic reference to Frenchman's Creek is found on the first edition Ordnance Survey 6in map of 1888. At the same time Frenchman's Pill is found applied to the cottage at the head of the creek. ('Pill' Farm, on the west side of the creek, was called Frenchman's Close). 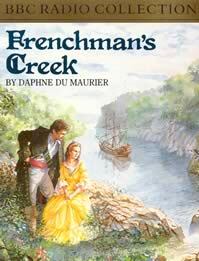 So whilst Daphne Du Maurier put the fizz into Frenchman's Creek she certainly didn't stomp the grapes. Something must have happened pre 1888 to provoke that name. Could it be that Frenchman here means French ship, in the sense that one finds Indiaman or man-o-war? Indeed the word Frenchmen, meaning 'French ships', was used as early as 1473. Perhaps the name is derived from an incident involving a French ship in the 1700's. And so my quest now is to find that incident, the pivotal point in history that turned no-name creek into Frenchman's. Retrospectively, I should have guessed this was going to be difficult, after all we are talking about one of the most remotest parts of Cornwall, not London. Owing to its distance from London, the Cornish coast has not held out much temptation to foreign invasion, but as Cornwall is near the mouth of the Channel, and it has many useful havens, often unfortified, piracy was commonplace. 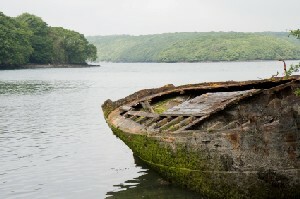 Of these havens, the Helford River was a favourite. Remote, narrow water inlets, providing storm protection made this the ideal location to discreetly hide a ship from His Majesty's Officers. However the reality of their practice was certainly not romantic & swashbuckling but barbaric and terrifying. The first pirates on the English coast were themselves English, and preyed as a rule on foreign shipping. By 1224, piracy of this nature had become sufficiently extensive to warrant state action and Geoffrey de Lucy was nominated keeper of the whole coast from Pevensey to Bristol. This district was divided only a month later, a keeper of Cornwall and Devon being appointed, whose principal duties were the suppression of piracy, the repulsion of raiders, and the maintenance of security for the coasting trade. Efforts were continually made by the government to quash piracy, but for some time they were not effective, owing to the imperfect state of the navy. It was Henry VIII that introduced dedicated naval ships and built forts at St. Mawes and Pendennis to guard Falmouth harbour. Commissioners in various parts of the county, and small squadrons, did what they could until the Elizabethan period. Then, under the Queen's keen grasp of affairs and the masterly and thorough administration of Lord Burghley, piracy, like most other matters, received systematic treatment. Unfortunately the fatal struggle of Charles I to maintain the navy failed, so that by the mid 1600's piracy was at its worst. Life in Cornwall at this time must have been at best unsettling, at worst terrifying, as the whole coast was in continual fear of piracy. 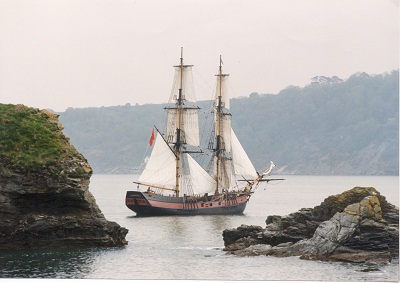 Helford was a constant haunt of pirates, and St. Keverne on The Lizard Peninsula is the subject of one of the most distressing of these outrages. Pirates didn't just seize boats and their contents, but their crews as well. On 15th June 1659 it is recorded that three fishing boats from St. Keverne, three from Helford and one from Mullion on The Lizard, all fishing off the Manacles near Coverack, not three leagues from shore, were taken by pirates and their crews carried away as captives. The number of boats is given as seven in every account, but the number, of men given varies between forty two and fifty. The same pirates had just previously taken five boats of Looe, which were engaged in deep sea fishing between England and Ireland. Graphic details are given of boats seen drifting unmanned and without sails, of weeping women, of constant fear of the raiding and destruction of the villages, and of the men that put to sea and were never seen again. It is no wonder then that the men of Looe, following an incident there "through terror of that misery whereunto these persons are carried by these cruel infidels" would rather "give over their trade than put their estates and persons into so great peril, there being now sixty vessels and about two hundred seamen without employment". The narrators then add "These pirates daily show themselves at St. Keverne, Mount's Bay and other places, that the poor fishermen are fearful not only to go to the seas, but likewise lest these pirates should come on shore and take them out of their houses". The consequences of piracy on this scale are hard to appreciate in the twenty first century, but perhaps the closest comparisons can be made from the piracy that is taking place off Somalia today. Can you imagine the international news coverage that would result if fifty Cornish people were taken captive by pirates today? Bitter, food for thought. So let us return to the quest to find either a battle, or piracy incident that occurred on the Helford River near Frenchman's Creek that was so important it changed the name of the creek forever. The facts are meagre, but at about the same time as the loss of the St. Keverne fishing boats, there occurred an exciting skirmish in the Helford River. On 11th May 1636, two Dunkirk frigates brought four French ships, taken by them as prizes, into Falmouth. On the 14th they set sail with their prizes, but were met outside the harbour by a Dutch pirate, the "Black Bull" of Amsterdam, which attacked them. The Dutchman chased one of the frigates under Pendennis fort, which opened fire on him. He therefore abandoned the pursuit, and chased the other frigate into the Helford, following her a mile up the river, till both vessels grounded. The Dutchman fired on her with his ordnance, landing thirty musketeers on the south side of the river, who shot into the frigate from the land, killing one of her men. The frigate surrendered, the Dutchman remaining in charge of her in defiance of His Majesty's Officers, who commanded him to deliver her to them. Eventually the Dutch captain was taken and sent to Portsmouth in custody. The complicated legal position was not argued out however, since most of the officers of the Admiralty had fled from Portsmouth to avoid the plague, and the last record of the matter in the Calendar of State Papers, which is dated August 13th, 1656, states that the "Black Bull" and the Dunkirk frigate were then still in Portsmouth harbour, twenty years after the incident on the Helford. Could this be the skirmish involving a French ship that catalytically caused the name Frenchman's Creek to stick? The answer is I don't know. It is plausible, but I truly don't know. Furthermore, I don't think anyone else knows either. However, for what my humble opinion is worth, I believe that the incident, along with the overall high incidence of French pirates on the Helford River, lead to this creek simply being considered as being "the Frenchman's Creek". I believe its naming would have been a warning to the local villagers to simply stay away and let the pirates get on with it. Would you have dared to walk along the footpath that flanks the shoreline of the creek at such at time? I know I wouldn't have! Nor would I have dared to venture to the crossing point at the head of the creek, known as Frenchman's Pill (passing point). Again, the name alone would have struck terror into me and kept me away. So my theory in a nutshell is that Frenchman's Creek was so named because it offered the most secret and safe mooring position in SW Cornwall for French pirates. Because of this popularity, call it a micro-invasion, the locals named it after the dominant resident and in doing so, warned others of the likelihood of pirates ahead. I wonder if any of those naughty French pirates hopped ashore and made Franco/Cornish baby pirates? Arh! Lord forgive me. I'm starting to think like Daphne Du Maurier. Acknowledgments are made to Helston Museum, The National Trust and St. Keverne History Society, without whose records this article would not have been possible. Alison McGregor, Lizard Peninsula Holiday Cottages.